Thanks so much to everyone for the comments and the emails. I feel so much better about things knowing that the blog is actually enjoyed and that the concesus is that it is worth maintaining. That's the first decision made. I have printed off everything that you have all said. There are so many excellent suggestions. I am now going away for a couple of weeks but when I get back I will have read all your ideas properly and will have come up with a strategy. I'll email and post when I'm back home. It just goes to show that banging one's head against a brick wall is such a daft thing to do when there are so many wise heads and great people out there who are willing to take time to offer ideas and suggestions! For the past hundred years, much has been written about the early editions of Christian texts discovered in the region that was once Roman Egypt. Scholars have cited these papyrus manuscripts--containing the Bible and other Christian works--as evidence of Christianity's presence in that historic area during the first three centuries AD. In Early Christian Books in Egypt, distinguished papyrologist Roger Bagnall shows that a great deal of this discussion and scholarship has been misdirected, biased, and at odds with the realities of the ancient world. Providing a detailed picture of the social, economic, and intellectual climate in which these manuscripts were written and circulated, he reveals that the number of Christian books from this period is likely fewer than previously believed. Listen carefully for ghostly chuckles during your next visit to Les Invalides. If you hear them, don’t worry - it’s merely Napoleon smirking at the continuing fallout from his 1798 Egyptian Campaign. In 1799, soldiers constructing Fort Julian at a port city called Rosetta (now called Rashid) pulled a large black stone, almost 4 feet tall, 28 inches wide, 11 inches thick and weighing approximately 1,700 pounds, out of the Nile delta muck. Imagine their shock at seeing the inscriptions after it was cleaned off. The stone was turned over to General Jacques-Francois de Menou who realized its significance and attempted to hide it from the British after they defeated Napoleon in 1801. Various stories still circulate on just how British troops finally wrested the stone from de Menou, either at gunpoint or a simple handover, but as of 1802, the Rosetta Stone was taken for permanent display at the British Museum. And except for one brief outing to the Louvre in 1972, it has not left the country since. However, while the Brits may have won the battle to possess the stone, the competition for deciphering it had only just begun and the French were determinedly nipping at English heels. Discovery Channel has found a star in Dr. Kara Cooney, a beguiling academic who takes the always interesting subject matter of all things Egypt and Ancient and breaks down their secret societies, ritual sacrifice, brutal religious edicts and macabre burials for those who are fascinated by the ancient cultures history and lore. "Out of Egypt" premieres Monday, August 24 at 9:00 and 10:00 PM (ET/PT) on Discovery Channel. She was also a hit at the recent TCA's in Pasadena, her panel was a fascinating glimpse into the linking of ancient civilizations, and repercussions of human instinct and tradition. Dr. Kara Cooney is a UCLA Professor of Egyptian Art and Architecture; think modern-day Indiana Jones in Jimmy Choos, as she bolts the lecture hall for tombs and temples around the world bringing an exciting new perspective to the most fascinating riddles in history. Kara uses her training and education of Egyptian customs and practices as a baseline to study how other ancient societies were formed. Article is available for purchase. This is something of a cry for help. 1) I am sure that most of you have noticed that whenever I go away the blog ceases to be updated for a while because I simply cannot keep up with it. It takes a minimum of an hour a day to update, and when I'm away that isn't convenient. Next week I'll be somewhere with no web connection so it won't even be updated sporadically. When I return to London from wherever I've been the blog takes hours to update. There are so many things wade through to find the items that might be of interest. Until you do something like this you have no idea how many frogs you have to kiss before you find a few princes, metaphorically speaking! When I came back from my father's place this time (only five days) there were over 600 Google Alerts waiting for me. Sticking my head in a bucket of freezing water would have been a rather more attractive option. I just don't have those spare hours. 2) I keep posting out of date articles because I don't have time or the energy to check every article, and my memory is apparently pretty useless because I don't recall posting things previously (the post re the Horemheb tomb opening is a good example). The number of times I've posted out of date "news" items recently is truly demoralizing. It is okay to make the occasional mistake but I'm making too many at the moment. 3) Usually, the stuff I post isn't actually news. Travel stories, magazine/journal announcements and book and exhibition reviews seem to dominate, even during the excavation season. It is more a matter of aggregating other people's online articles and posts and I have no idea what value this really is to people. Access to real news is restricted by the rules and regs of the SCA. I'm not sure that what I'm doing here is particularly useful. You could probably get the same results by intelligent use of Google Reader. I was wondering if there couldn't be a better way of doing this. I've thought of various ideas - restricting the content to certain categories of news, opening the blog out to collective ownership, offering to transfer ownership to someone else, or just shutting it down altogether. But all options seem to have problems with them. So I'm hoping that someone will have a better idea. 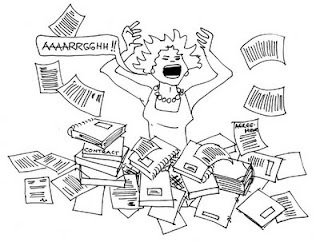 I started the blog for fun, and it is now more of a headache than anything. I don't know what the answer is but if any of you has a magic wand that you can wave (or just a good idea or two) I'd be very grateful! Four thousand years ago Egyptians had mastered the process of making madder, a red dye, according to a researcher who uncovered the earliest known example of the color still used today. Refining a technique that allows the study of microscopic bits of pigment, Marco Leona of the Metropolitan Museum of Art in New York was able to analyze the color of a fragment of leather from an ancient Egyptian quiver. The discovery that the color was madder is the earliest evidence for the complex chemical knowledge needed to extract the dye from a plant and turn it into a pigment, Leona reports in Tuesday's edition of Proceedings of the National Academy of Science. One approach to understanding Egyptian art would be to question its raison d’etre. We already know that its major purpose was to serve the needs of the elite, especially the Pharaoh and his retainers, both in this life and the next. We could definitely say that many scenes can be interpreted by not only what they depict, but also as a way of sending a message to those whose support the king required. The representation of males and females in New Kingdom Egyptian tombs is a clear case where the artist conveys a message other than visual reality. In the typical New Kingdom tomb painting, relief, or statue, males are dressed in a Shendyt with perhaps a shirt, while women wear tight-fitting sheath dresses, probably made from a single piece of cloth wrapped around the body. However, archaeological examples of ancient Egyptian clothing demonstrate that the most common garment was a bag tunic... a linen bag with sleeves that fit very loosely. Both men and women wore it. In art, however, men wear an outfit that suggests freedom of movement while a woman’s garment suggests restricted movement. Even without archaeological evidence, the typical female garment depicted in art could never match reality. The dresses are so impossibly tight that a woman could not move, sit, or walk. The real intention behind this representation is to reveal the woman’s body. These dresses clearly reveal the overall female form and the pubic triangle. Since the difference between everyday Egyptian reality and artistic presentation is so radical, there must have been a reason for the difference. 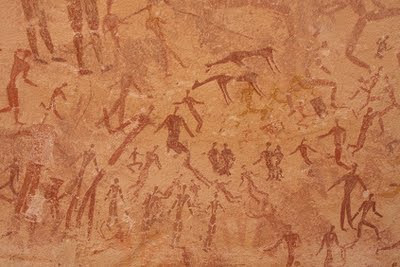 Men are generally active in tomb representations. During his tour of the Delta town of Rosetta to inaugurate development projects in the area, President Hosni Mubarak, along with Prime Minister Ahmed Nazif; Culture Minister Farouk Hosni; Zahi Hawass secretary- general of the Supreme Council of Antiquities (SCA); and other ministers and government officials last Thursday opened the town's National Museum. Mubarak viewed the various galleries of the museum, which altogether display 600 objects chosen to show the history of Rosetta from the time of the town's foundation in ancient times right through to the modern era. The pieces on display were carefully selected from the Islamic and Coptic museums and the Gayer Anderson House in Cairo. Another 200 objects were unearthed from archaeological sites around Rosetta. These include a collection of Omayyad and Ottoman gold and bronze coins, pots and pans, versions of the holy Quran and a number of 18th- and 19th-century weapons such as arrows, swords, knives and pistols. Tapestry, military and national Ottoman and Mamluk costumes are also on show. To give visitors an idea of what an Ottoman house looked liked, some galleries have been furnished with a complete set of Ottoman furniture consisting of a bedroom, reception room, kitchen and bathroom. In less than two weeks, on Aug. 22, a newly renovated - and completely transformed and updated - Egyptian mummy exhibit will open to the public. Visitors will enter between two ancient-looking pillars, right into what Kastell hopes will feel like an undisturbed Egyptian tomb. "My goal is to make the visitor feel like they're an Egyptologist studying this," she said. But it won't be completely ancient. The display will include surprising new information, gleaned from rare CT, or computed tomography, scans of the mummies that were donated two years ago by Genesis Medical Center, and it will do so with computerized touch-screen technology. Right now, the mummy room is empty and dark. The Putnam's two Egyptian mummies, still in their old cases, have been moved carefully into the room that connects to their exhibit room downstairs, but you'd have to crawl around and over shelving units to see them. Things are definitely out of place everywhere downstairs. But just wait. Big changes are on the way: more than $50,000 worth of work, paid for with lots of help from grants and in-kind contributions, said Betsy Matt Turner, the Putnam's development director. But the Hatshepsut discovery also highlights the struggle to back up recent spectacular findings in Egypt, including the unearthing of ancient tombs and mummies, investigations into how King Tut died, and even the discovery in the Siwa oasis of possibly the world's oldest human footprint. So far, the science shown in the Discovery Channel's "Secrets of Egypt's Lost Queen" has not been published in a reputable peer-reviewed scientific journal - the gold standard of scientific research worldwide. "I think the people at the Discovery Channel went way too much 'CSI,"' said biological anthropologist Angelique Corthals, referring to television's "Crime Scene Investigation" series. 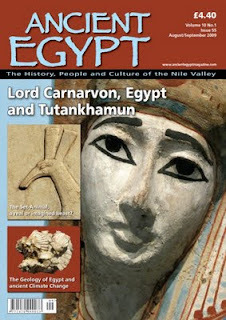 The August/September 2009 issue of “Ancient Egypt” magazine (published in the U.K.) is now available. This issue is also available as an electronic version which can be found at the web site www.ancientegyptmagazine.com This may be useful for anyone with a broadband connection who may have difficulty in getting hold of a paper copy of the magazine, or who might want to see a copy before subscribing. News from Egypt and the World of Egyptology: A larger-than-usual ‘From our Egypt Correspondent’ brings the latest news and information including reports on new work in the Valley of the Kings, on a new museum shortly to open at Kom Ombo and new discoveries in the Fayoum, at Karnak and at Taposiris Magna. 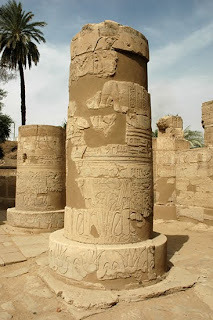 The Temple of El Tod and the Cult of Montu: Betty Schneider looks at the little-visited temple of the god Montu at El Tod, to the south of Luxor. More on the Missing Sarcophagus of Menkaura: The sarcophagus of Menkaura, removed from his pyramid at Giza, was lost at sea on its way to the UK. It is, however, possible to restore the original appearance of this important object, virtually, as Jon Bodsworth reveals. Osirisnet.net: Thierry Benderitter introduces his special web site about the tombs and mastabas of Egypt and explains how readers of AE can help in the site’s future development and content. The Geology of Egypt: The geological history of Egypt is complicated. Geologist Colin Reader gives an overview of the way the Egyptian landmass evolved and how the very nature of the country affected the ancient civilisation. 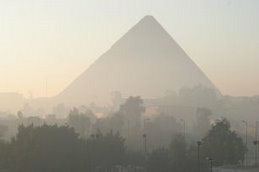 The Egypt Exploration Society: In the fourth of a series of articles on the history and work of the Egypt Exploration Society, Dr. Judith Bunbury looks at the hard evidence for ancient climate change in Egypt and Sudan – Egypt and the Global Cooling Crisis. Ancient Egypt at Highclere Castle: AE visits the new exhibition, which includes some splendid objects collected by the fifth Earl of Carnarvon and reveals much about his life and the Tutankhamun connection. The Seth-Animal: a Dog and its master: Seth, one of Egypt’s earliest gods, has always been a conundrum; originally benign, he came to represent chaos and war. What has always been uncertain is the exact nature of the Seth animal. Ken Moss suggests a likely candidate. PerMesut: in our regular feature for younger readers, Hilary Wilson looks at “Greeks, Wells and Shadows” and how to measure the height of a pyramid or the circumference of the Earth. 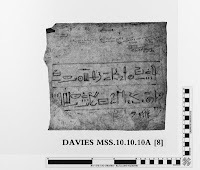 Net Fishing: our regular look at Egyptology on the Web, tracing the history of ancient Egypt. This issue Victor Blunden looks at the later Ramesside kings. Postscript: AE visits the last inhabitants of Sheikh Abd el-Qurna and the last baby to ever be born there. Articles on travelling the Eastern Deserts of Egypt, on flooding and sealed tombs in the Valley of the Kings and on the important site of Napta Playa. The Red land: The illustrated archaeology of Egypt’s Eastern Desert, by Steven Sidebotham, Martin Hense and Hendrijke Nouwens..
A History of Egypt from Earliest Times to the Present, by Jason Thompson. The Wabet: Tradition and Innovation on Temples of the Ptolemaic and Roman Period, by Filip Coppens. Bonaparte in Egypt, by J. Christopher Herold. Egyptian Temple Architecture: 100 years of Hungarian excavations in Egypt, 1907-2007, by Gyozo Voros. Old and Middle Kingdom Theban Tombs, by Rasha Soliman. Signs of Cleopatra: Reading an Icon Historically, by Mary Hamer. The Reign of Cleopatra,, by Stanley M. Burnstein. Isis in the Ancient World, by R.E. Witt. Reading Ancient Egyptian Poetry Among Other Histories, by Richard Parkinson. Middle kingdom Tomb Architecture at Lisht, by Dieter Arnold. The Gold of Honour in New kingdom Egypt, by Susanne Binder. Vernacular Mud-Brick Architecture in the Dakhleh Oasis, Egypt, by Wolf Schijns. Plus full Egyptology Society listings and UK lectures from August to October 2009 and listings of exhibitions and Egyptological events and now including listings of Egyptological Societies around the world..
A geophysical survey at the pyramid complex of Senwosret III at Dahshur sought to determine the suitability of magnetometry and electromagnetic induction (EMI, or conductivity) for mapping the area where several ancient boat-burials were found in the 1890s. At least one boat reported at the time of excavation remains unaccounted for. Tests demonstrated that magnetometry does detect subsurface structures of stone, fired brick, and unfired brick under current site conditions. Data indicated areas of geological activity as well as unexcavated archaeological remains, though no definitive traces of boat burials. No excavation was undertaken but another survey season is planned. Thanks very much to MaryC for pointing out another book review about Mistress of Nothing which looks at the way in which the character of Lucie Duff Gordon is treated. A new novel, The Mistress of Nothing, by Kate Pullinger, raises again the debate over faction. Pullinger's book is beautifully told and moving. It is based on Katherine Frank's acclaimed biography of Lucie Duff Gordon, my great-great grandmother. But to dramatise her tale, recounted in the novel by Lucie's maid, Sally Naldrett, Pullinger ends by turning Lucie into a vindictive monster. This is very different to the impression one gets from either Frank's biography or any other account of Lucie's life in Luxor during the 1860s, where she wrote her most famous book, Letters from Egypt. One cannot possibly accuse Pullinger of dishonesty. She acknowledges in an author's note at the end that she has "played fast and loose with the facts" and takes responsibility for all the "other untruths, fabrications and mistakes in this novel". But why cannot novelists use the far more legitimate technique of a roman-à-clef if they wish to rewrite events or characters for dramatic effect? Interesting. Much the same happened with The English Patient, where the name of a real person, Count Laszlo Almasy, was used in an entirely fictional context. I am back in London for the next few days but I am off again on Sunday. I'm away for at least 10 days and possibly longer. I'll be somewhere with no web access. I'll try to pick up emails a couple of times a week from an Internet cafe but I certainly won't be able to do the blog. With two photographs of the tomb. Minister of Culture, Farouk Hosni, announced today that the tomb of Haremhab, in the Valley of the King’s on Luxor’s West Bank, has been reopened following the installation of state-of-the-art equipment to control the rate of humidity within. He added that this tomb is the first to have such technology installed in an attempt to reduce and control the rate of humidity and heat, which has affected the tomb’s wall paintings in the past, leading to its original closure. The tomb of Haremhab, in the Valley of the King’s on Luxor’s West Bank, has been reopened today following the installation of state-of-the-art equipment to control the rate of humidity within. Belonging to Haremhab, the last Pharaoh of the 18th Dynasty from 1319 BC to late 1292 BC, the tomb is the first to have such technology installed. The aim is to reduce and control the rate of humidity and heat. This condition has heavily affected the burial’s wall paintings in the past, leading to its original closure. A scientific team is now monitoring the efficiency of the technology. If all operates successfully, the innovative equipment will be installed in all tombs in the Valley of the Kings. The article is accompanied by lots of photographs of the building, which was home to the Earl of Carnarvon who funded Carter's discovery of Tutankhamun. Very sad indeed. My first experience of Highclere was when I worked for Vodafone and we held our first couple of annual balls in the castle grounds before the company outgrew the facilities available - it was a truly great venue. Most recently I was lecturing there about 5000 years of agriculture in ancient Egypt. A marvellous, fun place. Tragic to see it falling apart. From a distance it looks like a classic fairytale castle. Its majestic architecture and stunning setting have allowed it to play host through the centuries to royalty, nobility and celebrity. But the studded wooden doors of Highclere Castle conceal a depressingly modern reality. Large parts of the historic stately home are verging on ruin. And the head of a family which once funded the discovery of Tutankhamun's tomb is facing a multi-million pound repair bill to safeguard its future. Now the Earl of Carnarvon, whose great grandfather is said to have been struck by the curse of the Pharaohs for his part in disturbing the Egyptian king's burial site, claims to be having sleepless nights over how - or if - it can be saved. For despite a facade of luxury and magnificence - and the patronage of a string of supposed celebrity weddings - the castle has been ravaged by damp and rot. Seeping water has caused stonework to crumble and ceilings to collapse. At least 50 rooms are uninhabitable. Its proud stone turrets - designed by the same architect who created the Houses of Parliament - are said to be in danger of decaying beyond repair unless urgent restoration work is carried out. A British writer has staked claim to finally finding the lost underworld of the pharaohs which has been rumoured to exist since the construction of the Great Pyramid nearly 5,000 years ago, creating a stir that is set to rock the Egyptological world. Armed only with the forgotten memoirs of a nineteenth century British explorer, history and science writer Andrew Collins, working alongside Egyptological researcher Nigel Skinner Simpson, tracked down the entrance to this forgotten cave system and were the first to explore it in modern times. The story begins in 1817 when Henry Salt, a former British Consul General to Egypt, and Italian explorer Giovanni Caviglia entered a series of what they described as “Catacombs” beneath Giza’s famous pyramid field and travelled for a distance of “several hundred yards”, before coming upon four large chambers from which went further cave passageways. Salt’s memoirs were never published, and no one seems to have recorded the caves existence since that time. “The importance of the memoirs had previously been overlooked,’ Collins said. “They’d been catalogued but never studied in depth. They were published, finally, in 2007. It turned out to be a previously unrecorded tomb west of the 5,000-year-old Great Pyramid, which Collins and his team explored in March 2008. Here they came upon an opening that led into a vast cave chamber filled with fallen rock debris, animal bones, colonies of bats and venomous spiders. Following in the footsteps of Salt and Caviglia, Collins and his team explored the caves for some distance, finding incised walls and mummy fragments, before the air became too thin to carry on. 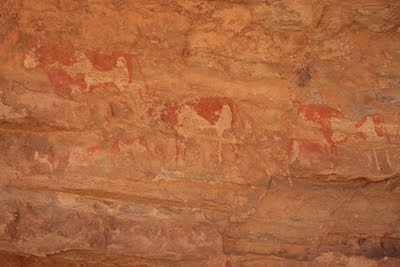 Subsequent visits to the caves revealed more about their extent and construction. Is it possible that Collins has beaten the Egyptologists at their own game by finding the entrance to Giza’s lost underworld? Oh okay, slightly off topic, but it is a quiet news day today. Few people spend their honeymoon catching and drawing blood from village dogs up and down Africa. But Ryan and Corin Boyko, two anthropologists at the University of California, Davis, chose this way to collect valuable genetic data that is casting a new light on the domestication of dogs. Scientists had thought that dogs, like these in Tibet, were domesticated from wolves in East Asia, but new work calls that into question. The opportunity to combine love with science arose when Ryan’s brother Adam Boyko, a biologist at Cornell University, was discussing dog genetics with his professor, Carlos Bustamante. Dr. Bustamante, just back from a visit to Venezuela, remarked on how small the street dogs there were. The two researchers wondered if the dogs carried a recently discovered gene that downsizes dogs from wolves and is found in all small dog breeds. Dr. Bustamante said the idea could be explored by collecting street dogs from up and down South America. Dr. Boyko, knowing his brother was planning a honeymoon in Africa but lacked the money to go far, proposed that the survey be done in Africa instead. “I paid for half their honeymoon,” Dr. Bustamante said. Ryan and Corin Boyko collected 223 samples of village dog blood from Egypt, Uganda and Namibia. The small gene question has not yet been assessed, but their samples, reported in the current issue of the Proceedings of the National Academy of Sciences, have called into question a finding on the origin of dog domestication from wolves. The origin is thought to be East Asia, based on a 2002 survey of both village dogs and breed dogs. But most of the village dogs in that survey came from East Asia, which could have tilted the outcome. The African village dogs turn out to have much the same amount of genetic diversity as those of East Asia. This is puzzling because the origin of a species is usually also the source of greatest genetic diversity. gerbils, lizards, scorpions, snakes and scarab beetles. quick enough to photograph them. Update: Thanks for the anonymous person who commented that this was a story dating from last year (do leave your name next time - it would be nice to thank the person, not someone nameless!). My apologies for the age of the article. It came up on my Google Alerts service and I was in a bit of a rush so I didn't bother to check it even though I thought that it was odd that they were digging in July! It’s not everyday that archaeologists can boast a discovery such as this one: the finding of a fully-intact archaeological site dating back 4,500 years. That is exactly what happened in the pyramid fields of Abusir, Egypt, where Czech experts recently opened a tomb belonging to an Egyptian dignitary. Czech experts revealed the news just a few days ago, having first thoroughly documented the state of the chamber back in November. According to experts, such a find has not been seen in 50 years. In the four-by-two metre chamber experts found a sarcophagus with the skeletal remains of a priest who lived in the time of the Egyptian Old Kingdom. Named Neferinpu, he was a member of the Egyptian middle-upper class. Also uncovered in his death chamber were the remains of relatives, as well as jewellery, ornaments and burial artefacts which survived the ravages of time. I asked Ladislav Bareš what the Czech Egyptologists know about Neferinpu – the tomb’s main inhabitant. 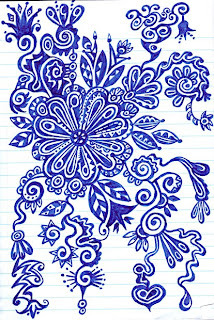 See the above for more (with photographs and audio alternative). 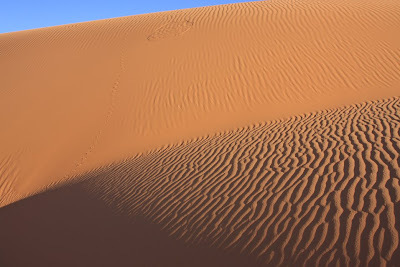 Sed Ali dug his heels into the hindquarters of a small, gray, Arabian-style horse, weaving through a pack of dilapidated camels as he trotted across the sand. Ali was giving our group of Northeastern University students a guided tour of the great pyramids in Giza, a family business he has been a part of since he was 6. Before we set out, Ali asked that we send the Egyptian government letters praising his business. He is concerned that the government’s modernization efforts at the historic site will mean the end for the independent camel operators who depend on the pyramids. “Without the camels, the place, it will die,’’ said Ali, 33, whose family has done this work for three generations. Egypt’s Supreme Council for Antiquities, which oversees this and other historic sites, is looking to protect the Giza pyramids by transforming the area’s largely unregulated industry of camel drivers, docents, and peddlers into a carefully controlled tourism complex by October, according to officials. This article mentions Egypt in passing, but it is actually a fascinating look at on of the problems facing conservation - an aging work force. Through mentoring efforts and knowledge-transfer programs, though, many national laboratories and technical organizations are trying to stave off amnesia by passing on the knowledge of their aging experts before it is too late. To that end, the Getty Foundation, in conjunction with the Getty Conservation Institute and the Getty Museum, has launched a global program to train a new generation of panel conservators. In recent decades, the Getty has helped protect some of the world's most fragile cultural monuments. Its field projects include the tomb of Queen Nefertari in Egypt, the wall paintings of the Mogao Grottoes in China, the Roman city of Herculaneum, and a 3.6 million-year-old trackway of hominid footprints in Tanzania. By seeking to preserve the expertise of panel conservators, Getty experts hope to protect the cultural memory embodied in paintings on wood, such as the Mona Lisa. In this way, Ms. Chui -- part master carpenter, part art scholar, part chemist and a dash of applied physicist -- is in the vanguard of this next generation of conservators. The portrait of the Madonna that she has been restoring for the past 14 months offers an object lesson in the problems that conservators confront. Egypt is one of the few countries in the Middle East where history is the main attraction. It is known for The Nile, Egyptian Scrolls and the Pyramid of Khufu – one of the seven wonders of the ancient world. And, while modern structures are rising from the desert sands throughout the GCC and regeneration takes place, old remnants can still be found in Egypt, which date back thousands of years. The country’s capital city is no exception either. Dominated by Islamic architecture, Cairo has been aptly nicknamed The City of a Thousand Minarets. What’s more, it has provided a home for residents since the tenth century. “Cairo is a city that has survived for centuries. Natural resources of survival as water and plantation are available in Cairo, which are not as accessible in the GCC,” Green Builders general manager Mohamed Nasreldin told Construction Week. But when it comes to the latest construction projects will it be out with the old and in with the new? The current development of New Cairo City suggests that the answer is yes, but this is actually an extension of the capital, being built to meet the demand of residential projects due to the rising population. And, according to general manager of Cairo Festival City Mohamed El Mikawi, demand for housing is extremely high. The Mistress of Nothing draws its inspiration from the life of Lucie, Lady Duff Gordon, Victorian writer, traveller and highly unconventional intellectual, whose celebrated salons were attended by Tennyson, Thackeray and George Meredith. In 1862, at the age of 40, creeping tuberculosis led Duff Gordon to leave her beloved husband and children in England and travel to Egypt, where it was hoped that the hot, dry climate would speed her recovery. The Duff Gordons, though well connected, were not wealthy, and Lucie was able to travel with only one servant, her maid Sally Naldrett. Turning her back on the English community, she settled in Luxor, where she cut her hair, exchanged her corsets for native male dress, and learned to speak and write Arabic. Though she was not always able to pay her servants properly, Lucie allowed them equally uncommon levels of freedom. However, when the unmarried Sally presumed to break one of the 19th century's strictest taboos, Lucie exhibited none of her habitual broadmindedness. Furious and implacable, she demanded that Sally leave the household and return, penniless and without references, to England. Lucie's letters from Egypt, later published, sparkled with her wit, passion and considerable rage at the abuses of the ruling Ottoman dynasty, giving the lie to the cliché of the decorous and submissive Victorian wife. They also provide irresistible provender for the novelist, though Pullinger claims to have been acutely aware of the difficulties inherent in tackling such a project. The Mistress of Nothing, her fourth novel, has been more than 10 years in the writing, one of those years apparently yielding only a single page. According to Pullinger, her endeavours were hampered by an aversion to historical fiction generally; she worried in particular about the clumsy deployment of research and the dangers of pastiche. There is little cause for concern on either of these fronts. Pullinger quotes from Duff Gordon's letters on several occasions, but Lucie herself is not the centre of this tale. Instead the story is told from the point of view of Sally, who finds herself caught between her devotion to her mistress and her desire for a life of her own in a country that she has come to love. Sally is no intellectual and certainly no politician; Lucie's perspectives and preoccupations are not hers. A rather sad letter to the newspaper Al Ahram Weekly, by Luxor resident Gordon Davies. Five years ago, a tall wall started to be built throughout Luxor, stretching as far as Karnak. Little by little parks disappeared and two years ago a whole side of a street adjacent to the train station was demolished, taking away the livelihood of people who had in all probability been in business for many years. I have witnessed the knocking down of every building on Al-Montazah Street, one hospital, and one hotel, and heard several rumours of additional attraction pieces, including bazaars, going down. The destruction in Luxor is still going on despite the fact that in many parts of the world there is a recession going on and also the construction industry is virtually dead but in Luxor it should be termed the destruction industry. There are still buildings being demolished along the Corniche. I am resigned to the fact that the ancient city of Luxor which I loved has now become the modern city of Luxor which I do not like. The whole thing is criminal and very illogical. On a more positive note I found the new ferry boats in Luxor wonderful and really add character to the area so full marks to whoever instigated the transformation of the ferry service. However, I am not impressed with the complete destruction of the ancient city of Luxor. It is all very sad because the mystery and the charm of the city are being eroded. Upon researching the meaning of the Egyptian Ankh, a cross with a loop at the top, it appears to have been used with multiple intentions. Originally, a historian thought the ankh was merely the symbol of a sandal, due to its shape, with its loop going around the ankle. Although many modern historians find this to be accurate, Egyptian academics at the University of Cairo, interpret that the ankh is representative of the pivotal role of the Nile. The oval head is said to represent the Nile delta, with the vertical mark representing the path of the river and the East and West arms representing the two sides of the country and their unification. Many others claim the ankh has a much deeper significance in its historical roles, however. This article explores some of the ankh's deeper claims to fame. What better setting for a summer auction replete with good American pieces than this quintessentially New England town, the setting for Thornton Wilder's Our Town ? Antiques dealers and collectors mixed with local characters straight out of the Pulitzer-prize winning play to fill the gallery at the old mill along the Contoocook River for The Cobbs' July 11 auction. The highlight was not early American, however, but early Egyptian — a Fayum sarcophagus portrait of a woman provoked a competition among nine phone bidders and only ended when it went to one for $143,750. The Egyptian painting dates to the Roman First Century AD and depicts a woman with earrings and two necklaces. It came from a Peterborough collector whose husband purchased it in New York City in the 1960s. It was accompanied by a letter verifying the purchase because the original receipt had not been located at the time of the auction. The portrait went to a London dealer buying for a client. Museum have started excavations of an ancient town, that's prime time was in the VI - VII century AD, positioned near Alexandria. This is the tenth archaeological season of Polish archaeologists at this site. The excavations will be continued in the main nave of the basilica and also in the area close to the temple's main, western, gate. During last year's excavation the archaeologists discovered a very interesting trading room (shops) and a representative hall with a floor decorated in the Opus Sectile technique. Archaeologists will also excavate the basilica's southern transept. "We have to remember, that although the basilica in Marea is decorated in a very rich manor, it hasn't been mentioned in any ancient sources. We are still looking for clues that could show us who built it, and who was the church's religious patron" - said Prof. Szymańska and Dr. Babraj. The experts from Kraków will also create a catalogue and document on picture the four piers in the port. The longest piers is 120 m. long. The scientists say that last year they only focused on the church, but it is only one of many buildings in the port town. I have been worried by the behaviour of my great-great-great-grandfather. I had always known that the 2nd Earl of Belmore went to Egypt and "rescued" – as they termed it then – some famous antiquities. What I didn't know was that before sending them to museums, he defaced them. Go to the Metropolitan Museum in New York and you'll see the name BELMORE inscribed in 3in-high Roman capitals on the side of the Temple of Dendar. As graffiti goes, it is beautifully carved. But then, so is the temple. Apparently he had mounting debts when, in 1813, he decided to flee the bailiffs by touring Egypt. He bought an 86ft schooner and spent £9,600 transforming it. He took his family and assorted others along, including the Countess Juliana, Rosa the lapdog, the family doctor and the vicar. I went to Egypt this spring to see whether there was any legacy.First stop, the Great Pyramid. And, dear oh dear, there at the summit, BELMORE. Thankfully he appears to have made no attempt to ship the Great Pyramid back to Britain. David Gill has been keeping an eye on the sales of Egyptian antiquities at Sotheby's. See the above page for his graph showing a comparison of the value of lots sold in the December and June sales in Sotheby's New York. There are a couple of articles which may be of interest (particularly the review of the Rosalie David book), but I've copied the whole lot into the post in case there are those of you who have wider interests. For reasons unknown, the only photos of Egypt that I have stored on my laptop are of the Gilf Kebir, so it was a choice of giving you more photos of north Wales, a rather nice collection from Italy, or photos of the Western Desert! So the Gilf it is. I'm sure that I have posted some of these before but you'll just have to bear with me! This is a shot of Eight Bells. 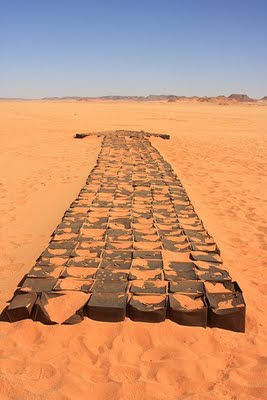 For those of you unfamiliar with the site, this is the north arrow at the WW2 airfield used by the Long Range Desert Group, just to the east of the Gilf Kebir, marked out in fuel cans. Archaeology comes in all forms. I'm away again as from tomorrow. going home for a visit to my father in north Wales. I'll be away for a week or so. I'm also collecting a new car and I may stay with a friend for a few days on the way back to London, so I'm not quite sure which day I'll be coming back. I'm not sure whether or not I'll have the opportunity to update the blog, but I'll have my laptop with me, so you never know. If I see any news about investigations of the pyramid of Khufu then I will certainly post on the subject, whether or not I have time to update on other items. Here's a snapshot from near home in Wales. If you have a fear of heights imagine taking a narrowboat over the Pontcysyllte aqueduct shown in the photograph. I did it once when I lived on a boat many years ago. On the tow-path side there's a railing but on the other side there's nothing between you and the valley below. I gripped the tiller for grim death. It still makes my hair stand on end to think about it! A team of radiographers at a London university have been preoccupied with a patient somewhat older than most - 2,500-year old Egyptian mummy Tahemaa. Specialists at City University in Islington, north London, used a CT scanner to learn more about how she died without damaging the corpse. They discovered that, unusually, the brain had been left inside the mummy - suggesting an apprentice embalmed her. 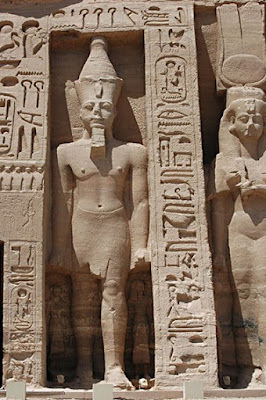 Tahemaa lived in a temple in Luxor, southern Egypt, and died aged about 28. Jayne Morgan, a senior lecturer in radiography at City University London, led the team. She said: "It is the first time I have had such an old patient. "But you suddenly realise you are still scanning a human being - even if it is 2,500 years old. "You scan it in exactly the same way as a human patient. "But because the mummy is stationary it gives you less problems with movement." Ms Morgan said the team's principle emotion was wonder. "The brain was still completely intact", said Ms Morgan. "We could see a fracture in her leg bone in very fine detail." Expert assistance from Egypt is finally on its way to conserve an Egyptian mummy dating back to 2500 BC at a museum here. The mummy, believed to be of Nasihu, daughter of the sixth Pharaoh of Egypt, is on display at the Andhra Pradesh State Archaeological Museum here since 1930 but is now decaying. A two member team from the Supreme Council of Antiquities, Egypt will visit Hyderabad for conservation of the mummy, believed to be over 4,500 years old. The department of archaeology and the Museum of Andhra Pradesh have long been seeking foreign assistance to restore the mummy, one of the six in Indian museums and the only mummy in south India. Tarek El Awdy, head of the research department at the Supreme Council Antiquities (SCA) and Sama Mohamed El Marghani, Director General of Treatment of Biological Damage at SCA will first make an assessment of the work needed to be done for preservation of Nasihu’s body. For the forthcoming couple of months the Egyptian Museum is hosting an exhibition of five dozen ancient Egyptian artefacts unearthed at three archaeological sites by the mission from Waseda University over the past 40 years. These unique objects have never before been exhibited. They derive from Abusir, the site of 11 pyramids south of Giza; Dahshour, the site of King Senefru's pyramids; and Malkata on Luxor's west bank, where the grandfather of Pharaoh Tutankhamun, Amenhotep III, dug a lake and built a palace for his beautiful and powerful wife, Queen Tiye. Among the objects on show are fragments of Pharaoh Amenhotep III's faience bracelet; a stele showing Pharaoh Tuthmosis IV making an offering to Horus; a faience sistrum with the name of Pharaoh Amasis; a terracotta statue of a recumbent lion with the name of King Khufu; two faience rings bearing the names of Tutankhamun and his wife, Ankhesenamun; a gold Amarna ring with a carnelian wedjat eye; and the cartonnage mask of the Middle-Kingdom commander Senu. Foundation deposits; painted clay pots; ceramic ushabti boxes; wooden naked female statues; inscribed scarabs and jewellery are also exhibited. Perhaps the most curious item on display is a limestone New Kingdom ostracon with enigmatic text markings similar to hieroglyphs and drawn in red and black, but not signifying any sentences. Parallels from the workmen's village at Deir Al-Medina suggest that these marks represented individual workmen, and the black and red dots were check marks. It is likely that this ostracon was used for recording the attendance of the workmen who built the royal tomb. Thanks to Charles Ellwood Jones for posting to The Ancient World Online blog that some 1,000 sheets of tracings made in various Theban tombs by Norman and Nina de Garis Davies sometime between 1920 and 1940, now in the Archive of the Griffith Institute, will be made available on the Institute's website. Upcoming exhibition: World of the Pharaohs, U.S.
World of the Pharaohs: Treasures of Egypt Revealed presents art and objects that dramatically exemplify the rich and diverse characteristics of one of the world’s great civilizations. The exhibition is particularly strong in excavated material from the Pyramid Age, the Old Kingdom (2675-2130 B.C. ), widely regarded as Egypt's finest hour. Egyptian artifacts from this period include a royal decree carved in limestone (Decree of Neferirkare), the false door of Inty, a Priestess of Inty and a relief scene from the tomb of Qar and Idu. Funerary objects are also well-represented including a Ptolemaic sarcophagus lid, a selection of stelae and several shabtys of officials. A visit to the exhibition is a rare opportunity to examine the people, language, art, land and mystery of ancient Egypt. Buy tickets to the exhibition World of the Pharaohs. See the above page for images and more information. Audio version of the same story also available on the above page. A local collection of mummies and artifacts from ancient Egypt are on display in Chile. The exhibit is at Santiago's Natural History Museum. The collection started in the 19th century with smaller artifacts and private collectors adding mummies along with their sarcophaguses. Museum official Bernadita Ojeda said, "All the mummies are about 2500 years old. They are from 300 to 400 B.C., the late period in Egypt. All of them are nobles." Museum director Claudio Gomez said the collection began at a time when objects of cultural heritage were rarely taken out of their home countries. One was bought by an ambassador and others donated by wealthy people in the 19th century. The most striking piece in the exhibit is the mummy known as Panubis whose sarcophagus has unique wood carvings. The historical Giza zoo, near the centre of Cairo, will stay where it was built over 120 years ago, confirmed the head of Islamic monuments of the Supreme Council of Antiquities, Hisham El Leithy, speaking to ANSAmed. After speculation about moving the zoo to another area of the Egyptian capital, the Secretary General of the Supreme Council of Antiquities, Zahi Hawass, has declared the zoological gardens an 'archaeological site', thereby restricting any intervention to the park. ''A committee of archaeologists inspected the buildings in the garden, which were built during the time of the Viceroy Ismail who ruled Egypt between 1863 and 1879, and decided to declare it an archaeological monument,'' explained Hawass, adding that two buildings inside of the zoo will be added to the roster of Islamic and Coptic antiquities, the ''Japanese kiosk and Citadel Hill''. Among the other unique characteristics of the zoological gardens, one of the oldest in the world, is the iron suspension bridge built by French architect Alexandre Gustave Eiffel, who also built the famous Parisian tower. The zoo, which is located on a 3 hectare surface, was built on the grounds of the summer residence of the royal family of King Farouk, known as the ''Garden of Pleasures'', which they continued to use for about 50 years after the opening of the park. Climate, and human responses to it, plays an integral part in the formation of society. Thus when climate change occurs, the result of either natural or human causes, societies should react and adapt – but do they? If so, what is the nature of that change, and are the responses positive or negative for the long term survival of society and its peoples? Archaeology, steeped in interdisciplinary studies and dealing with a longue durée view of society, offers detailed and verifiable insights into climate changes in the past: causes, responses and consequences. This conference, held under the umbrella of the University of Copenhagen’s Climate and Sustainability initiative, is held in memory of Stine Rossel, archaeozoologist and member of the Department of Cross Cultural & Regional Studies, who had a keen research interest in climate and past societies. See the above page for details, including abstracts.